of a variety of materials at cryogenic temperatures. which has a 5 year warranty, when purchased from L&G Cryogenics. For specific information on each model see the documents at the bottom of this page. * New Rugged Construction - Ribbed high strength aluminum body, magni-formed neck-tube design, and more durable paint. * Versatile storage system - Convenient canister numbered index location ring and tapered internal spider. * Superior Vacuum - Super insulation provides performance with maximum holding times. * Security - Accessory low-level alarm is available with remote monitor capability. * Mobility - Roller bases are available for some models. This unit uses a Canister/Cane Inventory System and will store up to (750) .5 cc straws. This model is perfect for storing small amounts of samples, as well as quarantining materials without having to buy a bigger unit to do it. Static Holding Time: 27 Days Neck Diameter: 2 in. Working Time: 17 Days Overall Height: 17.2 in. Evaporation Rate: .11 Liters/Day Overall Diameter: 7.6 in. Weight Empty: 7.2 lbs. Weight Full: 12.5 lbs. This model has the same storage capacity as the XTL3, but has a longer LN2 holding time due to it's larger size. Static Holding Time: 80 Days Neck Diameter: 2 in. Working Time: 50 Days Overall Height: 19 in. Evaporation Rate: .10 Liters/Day Overall Diameter: 15.6 in. Weight Empty: 19.6 lbs. Weight Full: 33.8 lbs. This unit uses a Canister/Cane Inventory System and stores up to (180) 1.2 ml vials or (1500) 1/2 cc straws. Small, convenient and a greater than three month static holding time makes the 10XT a great choice for long term cryogenic storage. Static Holding Time: 100 Days Neck Diameter: 2 in. Working Time: 62 Days Overall Height: 23.8 in. Evaporation Rate: .10 Liters/Day Overall Diameter: 11.4 in. Weight Empty: 16.5 lbs. Weight Full: 34.3 lbs. This unit uses Canister/Cane Inventory System and stores up to (210) 1.2 ml vials or (1122) 1/2 cc straws. More than 6 month Static Holding Time. This model is specifically made for artificial insemination storage. This unit comes with a 5-year manufacturer's warranty on the vacuum. An optional Low-Level alarm is available for this model. Static Holding Time: 221 Days Weight Full: 63.4 lbs. Working Time: 138 Days Neck Diameter: 2.18 in. Evaporation Rate: .095 Liters/Day Overall Height: 25.8 in. Liquid Nitrogen Capacity: 21 Overall Diameter: 15.6 in. More than 6 month Static Holding Time. This is one of the most popular XT models because of it's size, capacity and static holding time. An optional Low-Level alarm is available for this model. Static Holding Time: 230 Days Weight Full: 62.8 lbs. Working Time: 140 Days Neck Diameter: 2 in. Evaporation Rate: .09 Liters/Day Overall Height: 25.8 in. 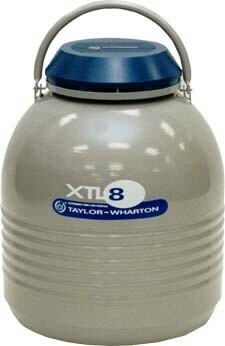 Liquid Nitrogen Capacity: 20.7 Overall Diameter: 15.6 in. This model boasts the largest static holding time out of all the rest. It will last for almost one full year without having to add more liquid nitrogen, if left alone. An optional Low-Level alarm is available for this model. Static Holding Time: 340 Days Weight Full: 95.3 lbs. Working Time: 212 Days Neck Diameter: 2 in. Evaporation Rate: .10 Liters/Day Overall Height: 26.3 in. 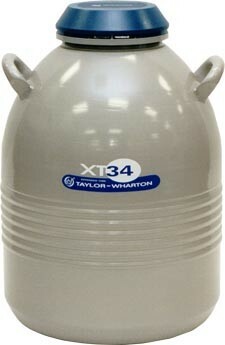 Liquid Nitrogen Capacity: 34 Overall Diameter: 18.8 in. *Static Holding Time - Refers to the amount of time that the dewar will successfully hold liquid nitrogen if left alone. Need a Roller Base or Safety Equipment? Click on our Accessories page!